MAX signature Cherry MX universal translucent clear black keycap set. A full set (124 + 8 keys) clear black translucent keycaps with laser etched characters that will fit 87/88 US/UK layout and 104/105 US/UK layout. Our special formulation “Smoke Translucent Clear Black” gives you a distinctive look of black-gray color when there is no light passthrough them. When backlit, this spectacular keycap diffuses the light into a magical glowing effect. This is the only All-in-one DIY replacement keycaps kit designed for backlight or non-backlight Cherry MX switch mechanical keyboards. 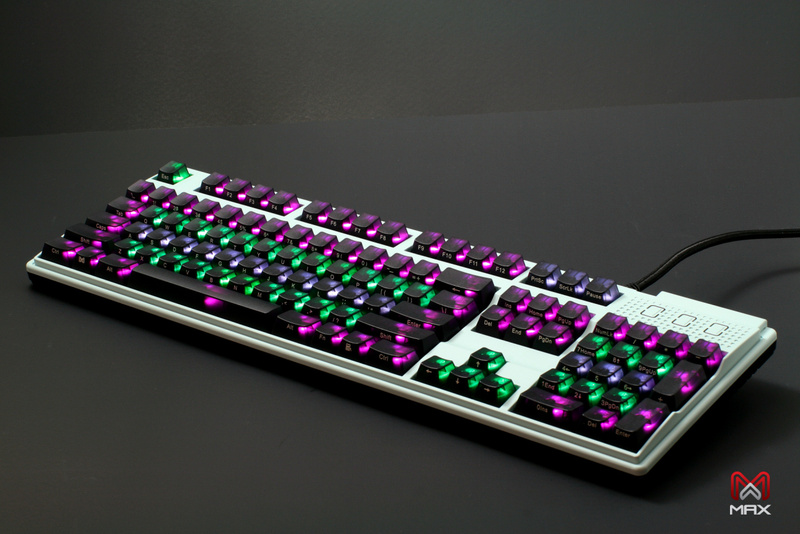 Kit includes all standard keys, custom keys, 1.5 modifier keys, 1.25 modifier keys, ISO Enter keys, and compatible with 4 different types of spacebar mounting sizes.